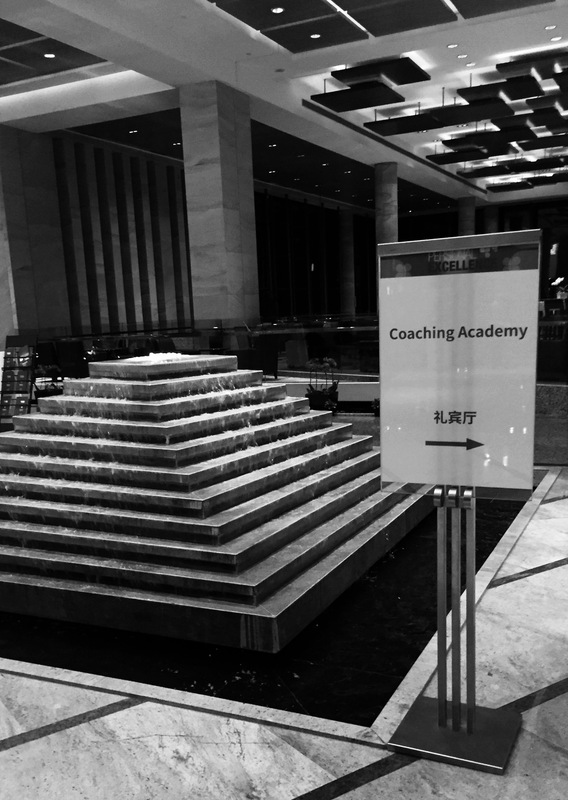 Theme: influencing with integrity – how to integrate a coaching attitude in your management role. I could immediately feel a strong recognition by the Chinese participants and at the same time some resistance. In the course of the training I understood that this kind of thinking is difficult to make present in the way of leading people. They don’t see how they can be teachers/coaches in their role-identity as managers. For them being a manager means giving orders to ensure a fast and high performance. The attitude to stimulate others to take their own responsibility and constantly stimulate learning, didn’t seem to be part of their representation of a manager. Working in different countries in Europe and the US, let me understand that also in these cultures combining the role as manager and a role as coach is a difficult challenge. But in here in China, I was able to refer to their deep ancient culture and tradition to stimulate this combination. The deep characteristic in the quote above has to do with the quality of inviting someone. So it’s not about pushing or forcing someone. Pushing and forcing have to do with power, with gaining a certain result within a certain timeframe and presupposes a kind of arrogant attitude. While inviting has to do with caring and connecting, with generosity and humbleness. If you invite someone, you also take time. I could feel that each of these ‘inviting elements’ or let’s say, ancient Chinese values, where still present in the participants. But they where hidden under a strong conviction about how a manager nowadays should be. I think that China is mainly seen in its high level of productivity and minor labour costs and yes, Chinese managers like to represent themselves like that, too. But If you tune into the deeper layer of their culture, you can also feel that complementary element where the importance of slow processes, human connections and a humble non authoritarian approach is (still) very present and important. I developed a system in order to come to the deep structure of excellence. which has to do with the necessary presence in excellence of generative complementarities. Those are 2 opponents, characteristics that are seemingly in opposition and always in tension. However, if you can make them available and present at the same time, it will stimulate the emergence of excellence. For example, the most important generative complementarity of excellence was identified as a combination of discipline and freedom. This is the fact of people being able to be disciplined and free at the same time. I think that the managers role and the coaching role could also be seen as a generative complementarity. If you think about the managers role, it is about execution, leading, demanding, giving tasks and accomplishing tasks. 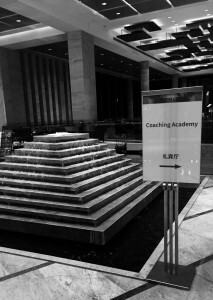 On the contrary, coaching has a facilitating role. Somehow these are in opposition, they can be in conflict. Some people say: “As a manager, I can’t be a coach, or as a coach, impossible to manage people”. I am convinced of the fact that if people find a way to combine those at the same time, I would call that excellency in leadership. It means that the manager is able to be very task oriented at the same time as fully relationally oriented. It is not about adding new tasks or things that demand a lot of time, but it is an attitude that will be executed at the same time as your managers role. A suggestion of what a manager could do and that does not take a lot of time is teach people how to listen on 2 levels at the same time. This is something we focus on at the Coaching Academy. For example when somebody is telling you about the task he/she has accomplished, you can just be focused on the task and its execution and of course the best result. What will happen if at the same time you could be focused and attentive to the learning opportunities or possible development areas for this person? As a manager you would listen on both levels: one of the management orientation, second a coach orientation. If you reach that goal, you will only need about a minute to say something, give feedback or express a recommendation that has to do with the learning or the development of that specific person, based on the small conversation you had. The extra minute you spend is really worth the investment, as it can lead to excellence for both the manager and the team. HRD Academy – center for training & developement in april, mei en juni 2016 in België. Feedback is zonder twijfel het meest belangrijke en accurate werkinstrument voor een coach, trainer of leidinggevende. Reflectieve feedback is het terugkoppelen van informatie zonder dat deze informatie voordien expliciet uitgesproken is. De coach destilleert die door te luisteren op meerdere niveaus tegelijk. Dit soort feedback raakt en zet in beweging! Vanuit zijn praktijk als Executive Coach, heeft Jan Ardui de laatste tien jaar veel excellente managers en leiders van succesvolle bedrijven in binnen- en buitenland begeleid. Een cruciale interventie in dit coachingsproces, is telkens weer het in kaart brengen en exploreren van de excellentie van de coachees. Door het exploreren van hun excellentie, wordt een rijk veld van interne en externe condities zichtbaar, die aanwezig dienen te zijn om een duurzame excellentie in hun gedrag en houding te kunnen garanderen. Tijdens deze vijfdaagse training leer je stapsgewijs iemands excellentie in kaart te brengen. We exploreren de persoonlijk dynamieken en strategieën én de externe condities die noodzakelijk zijn om de unieke excellentie van iemand tot expressie te brengen en te stimuleren.